A history of the UUA journey toward becoming an anti-racist, anti-oppressive, multicultural movement. A history of the UUA journey toward becoming an anti-racist, anti-oppressive, multicultural movement. The Arc of the Universe is Long covers the fourteen years that begin with the passage of the racial and cultural diversity resolution at Calgary, in Canada, in 1992 and traces developments through General Assembly 2006. Using interviews and written records, the authors bring to life the voices and stories that represent many perspectives, all addressing issues of race and ethnicity in our congregations and our association. For the free online study guide by Leslie Takahashi click here. Identity. This journey has been one about identity and identities, the multiple ones that shape us as Unitarian Universalists and the various truths we hold each to ourselves. Our search for identity as a religious people—as individuals, as groups with shared characteristics, as congregations, and as an Association—seems also caught up in our identity searches around issues of race. Our identities as Unitarian Universalists, as liberal religionists, as justice-seeking people, are all intertwined here. Faith. As an Association, we are a religious body and, as such, this has been a journey of faith—faith in the sense that process theologian Henry Nelson Wieman defines it, faith as an act and a series of actions. It has also been about faith in the sense that the efforts to address racism within our Association have caused deep conversations about the nature of our faith, not only what is fitting for us to do together but also what we believe together and what vision we share for our collective future. Relationship. How we are in covenant and how we are in conflict are vital threads of the collective story you are about to read. A series of relationships sets the parameters of these narratives: relationships between the majority culture in our Association and those historically marginalized; between blacks and whites, much marked by residual emotions from the controversies of previous decades; within multicultural complexities as other races and ethnicities entered the dialogue; between the rights of individuals and the dream of a collective that is more representative of the communities we serve and better embodies our deepest values; between action and reaction; between time and money; between congregations and the Association staff; and on and on. "Takahashi-Morris, Spencer and Roush have written an essential book, a brave and compelling account of the history that we must ponder and understand as we continue our work for racial justice, healing, and reconciliation. They invite us to acknowledge the multiple perspectives shaping our complex struggles over racial justice and enable us to understand the different views of how to best work to end racism and build justice. This is a very human story of how we live together, and try to find together our best selves, selves that are accountable for exploitation and denial, selves that work together for the flourishing of all. "Arc of the Universe is truly a gift to us all, a labor of integrity and love." 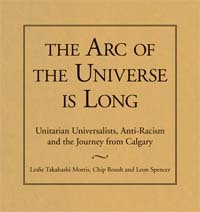 "If you want to understand what transpired in the UUA at the turn of the century there is only one place to start: The Arc of the Universe Is Long: Unitarian Universalists, Anti-Racism, and the Journey from Calgary. It is a comprehensive exploration of a transformation. Beyond honestly capturing the diversity of opinions of that era it offers moving testimonials and powerful stories. Gathering and organizing this important material must have been a herculean task and for that we own the authors our thanks. This fair and even-handed presentation of the UUA's response to the 1992 General Assembly resolution is an invaluable as a resource and yet it is presented in a readable, interesting way that is touched with religious sensibility. They tell a tale of transformation that is as encouraging as it was difficult; it is an invitation to continue beckoning us forward.